Adobe smartened up the Curves command for recent versions of Photoshop, providing new automatic presets that can bend tones for you and adding displays of histogram, clipping, and other information. Curves are a way of changing the highlights, midtones, and shadows entirely independently. You can change the values of pixels at any point along the brightness-level continuum, so you have, in effect, 256 locations at which you can make corrections. 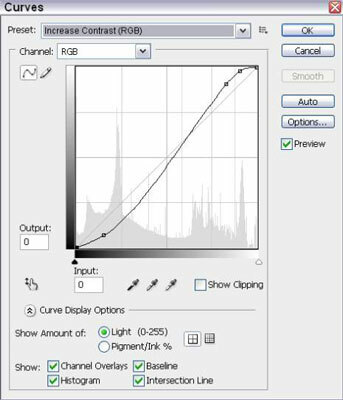 The Curves dialog box includes a two-dimensional graph, with the horizontal axis mapping the brightness values as they are before you make image corrections. The vertical axis maps the brightness values after correction. By default, the lower-left corner of the graph represents pure black (0, 0), and the upper-right corner represents pure white (255, 255). When you open the dialog box, the graph begins as a straight line because, unless you make changes, the input is exactly the same as the output, forming a direct 1:1 correlation. When you change the shape of the curve, you change the values in the image at each point within the curve. The best way to see what this tool can do is to play with it (press Ctrl+M on a PC, Command+M on the Mac, to access the dialog box, or use the Image→Adjustments menu). Try out some of the preset curves to see how they affect your image. After you use Photoshop for a while, you begin to see how curves can provide the precise control that you need over tonal values.